Quinoa is a very good source of manganese as well as a good source of magnesium, iron, copper and phosphorus. This “grain” may be especially valuable for persons with migraine headaches, diabetes and atherosclerosis. Quinoa is a good source of magnesium, a mineral that helps relax blood vessels, preventing the constriction and rebound dilation characteristic of migraines. Quinoa is also a good source of riboflavin (vitamin B2) which is necessary for proper energy production within cells. Same as soaking your nuts, sprouting has many nutritional benefits. Sprouting is a process that germinates grains, seeds or legumes which in turn makes them more easily digested and produces additional vitamins and minerals including vitamin C, vitamin B and Carotene. 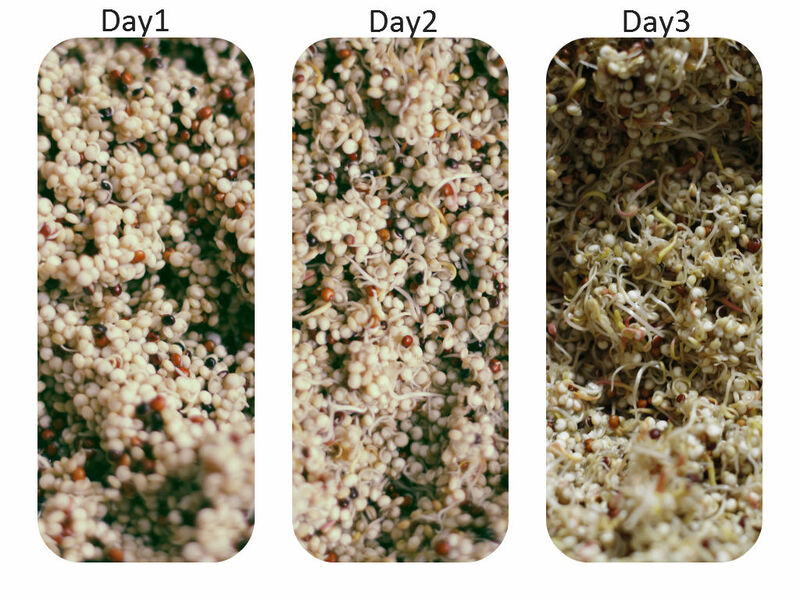 Another benefit to sprouting and soaking is the resulting decrease in phytic acid. Phytic acid is an enzyme inhibitor, which means that it blocks the absorption of vitamins and minerals and can also cause poor digestion and an unhealthy gut. If you do eat grains, it’s best to soak or sprout them first. Sprouts belong to the highly alkaline good group along with alkaline water, Himalayan salt, green vegetables (grasses, cucumber, kale, kelp, spinach, parsley, broccoli) and low sugar fruits. The opposite end of the spectrum, highly acidic food group, has alcohol, coffee, black tea, artificial sweeteners, all meats, seafood, dairy, processed foods, jam, miso, soy sauce, vinegar and yeast. If your body is in an acidic condition from eating acid-forming foods, getting stress, a lack of sleep and anxiety, your body tries to return to pH balance by using up reserved alkaline minerals: sodium, calcium, potassium and magnesium. This results in the depletion of alkaline minerals from your body. Eating alkaline foods helps to bring your body’s pH into balance. Acid foods aren’t necessarily always ‘bad’, they just need to be balanced with a good dose of alkalising foods. The recommended ratio is 80% Alkaline to 20% Acidic. To be honest, I don’t follow an alkaline diet or meal plan. To me, having more nutritious foods in your diet, having a good night sleep and being happy is more important than being picky with alkaline vs acidic foods. You can sprout legumes (like lentil, chickpea, mung bean, soy bean), cereals (corn, rice, quinoa, amaranth, buckwheat, oat) or oil seeds (sesame, sunflower, almond, hazelnut, linseed, peanut). I don’t have a sprouter at home, so just use a strainer instead, which works okay for me. Here is how I do at home. Transfer the quinoa to a tray or plate and move to a dark area at room temperature away from direct sunlight. Cover with a cloth. Rinse and drain the quinoa every few hours for a couple of days. You will see the little roots coming out. Amazing! It might take less or more depending on temperature and humidity. The quinoa should eventually sprout into a plate full of spiral-shaped roots that are at least one-quarter inch in length. Let the quinoa sprouts dry out for up to 12 hours before you store away in an air-tight container or a sealed plastic bag. Keep them in the fridge up to 2 weeks. You can lightly cook sprouted quinoa or use as it is. Mix with salads, make healthy bread, sprinkle in your smoothie bowl, etc.